Medical science, based as it is upon the evolutionary model, believes that disease occurs primarily as the result of defects within the human body. The approach to disease management, therefore, is to attack the body to correct the faulty process or remove the defective organ. For much of the twentieth century certain organs were believed to be obsolete. They were referred to as vestigial – organs that had served a purpose at some point in the evolutionary process, but which were no longer of any value. Vestigial organs were considered obsolete at best and focal points of disease development at worst. This warped view of the human body led to the practice of performing prophylactic (preemptive) operations to remove the offensive part before disease could develop. The January-March 1919 issue of the Journal of the National Medical Association carried an article titled "Prophylactic Tonsillectomy” by W. Harry Barnes, M.D. Dr. Barnes’ comments are illustrative of the obsolescent view of certain body organs. Prophylactic tonsillectomy remained popular into the 1950s. It was common for schoolchildren to be lined up over the summer for their tonsillectomies. Many were done on kitchen tables as the physician made his rounds through the community. In the 1920s it became fashionable to destroy the thymus gland of infants and children with radiation. This practice continued into the 1960s. It was justified by the belief that the thymus gland either performed some unknown function before birth or was a vestigial organ. Prophylactic appendectomies are still commonly performed during other procedures such as Caesarian sections. Australian physicians who spend the winter in Antarctica are required to undergo prophylactic appendectomies. It is now known that the tonsils, appendix, and thymus play important roles in the development of the body’s immune system. The tonsils and adenoids form a ring around the nose and throat and are therefore perfectly situated to recognize foreign material that is entering the body with breathing and eating. The appendix and tissues called Peyer’s patches play a similar role in the intestinal tract. The thymus plays a key role in the development of T lymphocytes, white blood cells that play a major role in protecting the body from infectious diseases. While individuals generally survive without difficulty following tonsillectomies and appendectomies, loss of the thymus makes one much more susceptible to infections, cancer, and many chronic diseases. The practice of routinely removing "vestigial” organs has left an indelible mark on American medicine. While "vestigial” organs are no longer being removed, the practice gave physicians a cavalier attitude about other organs within the body. Body parts that have a recognized function, but which are not needed for survival, are still removed at the slightest hint of trouble. Women with a strong family history of breast cancer are offered prophylactic mastectomies. While they are not as common as they once were, hysterectomies are still performed much more often than necessary. Today one of U.S. surgeons’ favorite targets is the gallbladder. The gall bladder is a sack that is located just below the liver. It serves as a storage reservoir for bile. Following a meal, especially if it is a fatty meal, the gall bladder contracts to inject a bolus of bile into the small intestine to aid the digestive process. People who lose their gall bladder can survive, but many have lifelong difficulty digesting fats. This leads to gassiness, bloating, and diarrhea following fatty meals. There are times that cholecystectomy – the removal of the gallbladder – is life-saving. Unfortunately, one of the primary reasons for gallbladder removal today is that it is considered to be non-functioning or poorly functioning. Just as normal thymus glands were destroyed during the middle decades of the twentieth century due to the mistaken belief that thymus enlargement was responsible for diseases or death that are now known to be completely unrelated to the thymus, normal gallbladders are being removed today for treatment of symptoms that are totally unconnected to the gallbladder. To understand what conditions can affect the gallbladder and appreciate which ones indicate the need for removal of the organ it is necessary to know the surrounding anatomy. (Figure 1) Bile is produced by the liver and secreted through the common hepatic duct. Some of the bile follows the common bile duct directly into the duodenum, the first part of the small intestine, but much of the bile enters the gallbladder through the cystic duct. 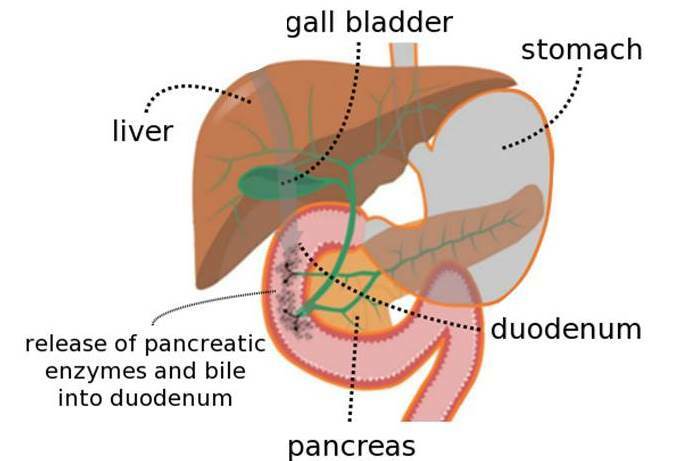 The pancreas manufactures digestive enzymes and releases them though the pancreatic duct, which joins the common bile duct just before it opens into the small intestine. A small muscle called the sphincter of Odi controls the flow of bile and pancreatic enzymes. One of the most common gallbladder problems is the development of stones. These stones occur when cholesterol, which is one of the major bile constituents, comes out of solution and solidifies to form crystals. In some cases a single large stone will form; in others dozens of small stones will develop. A single large gallstone will rarely, if ever, cause a problem. A small stone can exit the gallbladder through the cystic duct and pass down the common bile duct through the sphincter of Odi unnoticed. Most small stones pass uneventfully into the small intestine, but intermediate stones that are over 5 mm in diameter can cause serious problems. These stones are small enough to slip out of the gallbladder but too large to clear the sphincter of Odi. When they become stuck in the common bile duct, nausea, vomiting, and spasms of severe pain are triggered as the body tries to force the stone through the narrow opening into the duodenum. Once the stone has blocked the common bile duct, bile and digestive enzymes will begin to back up and cause severe life-threatening inflammation of the liver and pancreas. Bile duct stones are almost always treated by surgical removal of the gallbladder. Even gallstones that are not causing any symptoms are generally viewed as an indication for cholecystectomy (gallbladder removal). This is an indication of the degree to which physicians hold the gallbladder in disdain. Technologies such as endoscopic sphincterotomy, in which the sphinter of Odi is opened to allow stones to pass, and extra-corporeal shock wave lithotripsy, which can break stones into fragments that can easily pass into the small intestine have been available for decades. The only reason they are not made available to people with gallstones is the generally accepted belief that the gallbladder is of little value and is therefore expendable. I am regularly asked about gallbladder flushes. Several recipes exist, typically involving the ingestion of a large volume of olive oil in combination with freshly squeezed lemon or grapefruit juice. Others recommend the use of Epsom salts. People report the expulsion of hundreds of stones following a flush, and some are described as being the size of golf balls. The gallbladder is not capable of holding hundreds of stones, nor could a stone the size of a golf ball pass through the bile duct. What are mistakenly identified as gallstones are actually balls of what could be called soap. Soap is formed when fat is combined with a mineral and alkali. A classic recipe combines olive oil with lye. Lye is a mineral, sodium, and an alkai, hydroxide. Colors can be added. When olive oil is mixed with a mineral (potassium from citrus juice or magnesium from Epsom salts) and bile, which is alkaline, soap balls of various sizes and shapes form. In 2005, investigators analyzed "stones” obtained from a gallbladder flush and found this to be the case. They published their findings in the journal Lancet. If stones are not causing symptoms, I recommend that lecithin be added to one’s daily regimen. Lecithin is available as granules, which can be sprinkled on foods such as cereals and salads, or as capsules. Lecithin has the ability to lower the melting point of cholesterol. When lecithin is not present the melting point of cholesterol is approximately 180 degrees Fahrenheit, nearly twice body temperature. When lecithin is present, however, the melting point of cholesterol falls to approximately 60 degrees, which is well below body temperature. This means that cholesterol stones that exist may actually melt under the influence of lecithin. I have observed this phenomenon in individuals who were advised to have their gallbladder removed, but who wished to postpone the procedure. There are two conditions under which there is not a reasonable alternative to cholecystectomy. One is acute cholecystitis, a condition in which the gallbladder has become inflamed and is in danger of rupturing. The other is when cancer of the gallbladder is present. The vast majority of gallbladder removal operations today, however, are performed simply because the gallbladder is said to be poorly functioning. In these instances the gallbladder is perfectly normal. It is not inflamed. It does not contain stones. It has simply failed to excrete the expected amount of bile in response to a fatty challenge. I am at a loss to understand how removing a poorly functioning gallbladder will restore it to optimum activity. It appears obvious that, once removed, gallbladder function will never again be possible. Why then is such an illogical procedure performed routinely? Simply because physicians are so poorly trained in the structural mechanics of the body. Doctors are taught a great deal about internal medicine; they are taught very little about structural medicine. Consequently, when a patient presents with complaints of pain in the right upper abdomen or right lower chest and diagnostic studies fail to reveal a cause, the gallbladder is assumed to be at fault. In nearly all cases, however, the gallbladder is an innocent bystander. The pain is being triggered by a rib that has slipped out of place ever so slightly. A rib that is not moving freely can trigger pain anywhere along its course. Many times the pain appears in the general area in which the gallbladder is located. The problem is easily corrected, usually requiring only a single visit to someone skilled in skeletal manipulation. Unfortunately, few physicians are even aware that the possibility exists. Lacking an alternative, they opt for removal of the "non-essential” gallbladder. The gallbladder may not be essential to survival, but it plays an important role in the digestive system. Its removal has consequences that are often unpleasant. When confronted with what is said to be a gallbladder challenge I encourage you to get another opinion from a chiropractor or other practitioner who understands how to recognize and correct problems that arise from skeletal issues. Do not part with your gallbladder is another option is available.